It’s not uncommon for people to have problems with their laptops at the most inopportune times. From problems with a mouse pad that’s too sensitive to the touch to dealing with a monitor that will not turn on at all, there are numerous kinds of issues that a owner may experience when they are trying to use their laptop. One common problem that many users experience is having issues with the laptop keyboard not working. 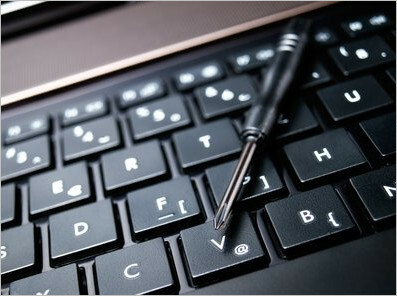 Solving a laptop keyboard problem does not have to be a difficult undertaking if you know how to troubleshoot. Which means, to make the necessary repairs, the owner of the laptop or the computer repair technician will need to do a little research. Since these issues may be the result of one or more problems, it is important for you to look at the following areas to see exactly what they will need to fix. Here’s a list of the most common things that should be done. Now this is a temporary solution but it can get the job done until you got your keyboard fixed. You can enable the on-screen keyboard if your touch-pad is working. If not try to get a USB mouse from someone then enable the on-screen keyboard. Just navigate to go to Start >> All programs >> Accessories >> Ease of access and then click On-screen keyborad. Though some problems that users experience may appear to be difficult and costly, they can be taken care of with one simple step. In fact, even though this step is very simple for anyone to do, it usually takes care of a wide range of different simple to complex concerns. In specific, it usually involves simply rebooting the laptop. However, if rebooting the laptop does not fix the keyboard, the person try one of the solutions listed below. Even though this problem may only appear in the older laptops, it can happen to any make, model and year. These problems involve laptop owners and users dropping crumbs in the keyboard. Because keyboards are delicate devices that can stop working virtually anytime due to water, crumbs and any other small debris, it is important that they stay clean at all times. So, when a user is negligent, they may eat over the laptop and drop crumbs down on the inside. Therefore, before the keys on the laptop begin to work properly again, it will need to be cleaned out thoroughly. To do that hold your laptop upside down and give it a proper shake. You can also use a computer vacuum to clean out the remaining particles. Make sure you don’t use a regular vacuum cleaner as those are too powerful and might cause more damage to your keyboard. In some cases, you may need to go a few steps further if you find that there are sticky substances inside. This can be done by cleaning the keyboard with a cotton swab and a few drops of alcohol. And of course be very careful. If you have created a system restore point when your keyboard was working, then you can try to restore the system. This will fix the keyboard issue if was caused by installing unknown software. Always beware before installing any software in your computer. In the previous example, it was a hardware problem because the keyboard cable was not connected to the motherboard properly. Which meant, the technician would have to go on the inside of the laptop to fix the problem. In some laptop repair problems,the problem is not hardware, but software issues that need to be fixed. Therefore, the computer technician may need to install additional software on the laptop to correct the problem that occurred. In specific, the computer technician may need to re-install the laptop’s drivers again, due to a problem with conflicting third party software applications on the laptop. Though this problem may not be the most common, it can happen and that is a bad connection inside of the laptop. In this situation, the motherboard is disconnected from the keyboard, and will not work at all. Therefore, the person may need a technician that knows what they are doing to fix the problem. All the technician will do is to connect the right cable from the keyboard to the motherboard and all is well. Even though this is a simple fix to repair, owners should heed precautions. Especially, since open up the laptop and entering it incorrectly may cause damage that cannot be repaired. If the owner and computer technician has checked all of these areas and the problem is still not resolved, they may need to replace the keyboard on the laptop instead of repairing it. This is because the keyboard may simply have a defect that should be reported to the manufacturer. If the laptop has a warranty that’s not outdated, they can send the laptop back to the manufacturer for this fix and it will be fixed at little to no cost to the owner. I hope this article helped you to fix the keyboard issue in your laptop. Please leave a comment below letting us know if your keyboard came back to life!